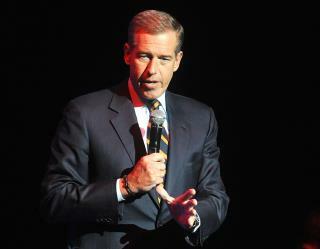 (Newser) – It's been awhile since "Brian Williams" and "controversy" have been uttered in the same sentence, but might as well take a crack at it again now that we're solidly in 2017. The MSNBC newscaster was among those providing commentary Thursday night after the US launched dozens of Tomahawk missiles at a Syrian airfield, and while responses to the strike ran the gamut from "decisive" to "unlawful," Williams used a descriptor that few (if any others) did, per Adweek. "I am tempted to quote the great Leonard Cohen: 'I am guided by the beauty of our weapons,'" Williams waxed poetic (Variety notes it's a line from Cohen's "First We Take Manhattan"), as a video in the background showed the missiles hurtling from the US warships toward land. Flying "Telephone poles" beautiful? Hardly, for it would be akin to describe fresh turd as aromatic! I didn't see it. but I saw the message online. IT was SJW and maddow fans calling MSNBC sexist for switching over to brian Williams, instead of maddow. But this guy thinks its sick to call weapons of war beautiful.. And the turd is actually from my town I live in now. lying in bed, just like Brian Wilson did.